I don't usually knit much in the summer. It's not exactly something you can take to the beach with you! But this year I have several friends due in October so I did manage to get a few small projects started and finished. 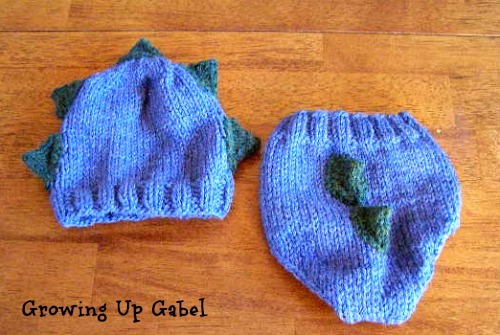 One of my friends found a photo of a dinosaur hat and diaper cover set used as a photo prop for a newborn boy. I couldn't find a pattern for the exact set she wanted, but I did manage to pull together a few different patterns to make this set. That hat is Roar by Tot Toppers. I've made a lot of these hats and they are always a hit! They are also easy to make. The spikes do take a bit of fiddling, but nothing too hard. The diaper cover is the Snapdragon Soaker pattern. This is the first soaker I've knit and I absolutely loved it! It was so much fun to see it all come together and using a Kitchener stitch to sew up the crotch is genius. I made a couple of extra spikes form the Roar pattern and sewed them on to the soaker. The yarn is Wool-Easy by Lion Brand. I don't like to use super expensive yarn for baby projects and find that Wool Ease is a nice blend at a reasonable price. Plus it's machine washable, which is always nice for Mommy. Hopefully this all fits nicely and little boy can get some adorable newborn pictures in it. This post is linked to My Merry Messy Life. Very nice Camille! I think it’s adorable and makes an awesome gift. Thanks for sharing at Hookin On Hump Day!